Its ceilings with frescos, its marble floors with typical Genoese patterns as well as the ancient fireplace in the kitchen and the large windows will enrich your stay in Genoa and will teach you something from the city's important history. OStellin is a centrally located hostel offering cheap and affordable accommodation in the centre of Genoa. 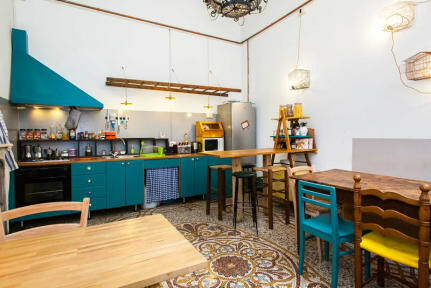 The hostel is suitable for guests with different needs: young travelers and backpackers, exchange international students who are looking for a stable arrangement, but also families with children, couples, groups, young workers, and much more. Our hostel consists of two parts: the hostel and dependance. The first one has four rooms, two in-room restrooms and one shared bathroom. It can host up to 25 people. We have 2 dorms with 8 beds, one 6-bed dorm, which includes two triple bunk beds (double on bottom and single on top) and a private double room with shared bathroom. There is also an equipped kitchen, a lounge area with 2 couches and the reception with the staff available 24 hours. The dependance has 3 private rooms (king size bed) with 2 shared bathrooms (one with a shower), a kitchen, and a cosy lounge area. There is NO reception, but the staff is available 24 hours in the adjacent building. We absolutely enjoyed our stay here! It‘s great to get to know other travellers and the staff is super friendly and open! I would also recommend doing the free walking tour with Spyro. Cool spot, good people, inclusive & homey vibe. I abolutely loved my stay here. The staff were all amazing!! They have breakfast in the kitchen in the morning and you can use the kitchen as you would like. There was an incredible free walking tour of the city that I definitely recommend. The guide was super knowledgeable and it was such a fun time and a good introduction to the city. I would love to stay here again the next time I'm in Genoa! Absolutely loved this hostel. The staff were super friendly and helpful! It’s a great hostel for meeting people! Would highly recommend the free walking tour too! My boyfriend and I had an amazing stay at Ostellin! The staff cooks a low cost dinner each night that you can opt in for. The hostel is in a great location, and they offer a free walking tour with Spyros that is probably the best tour I have ever been on. We were sad to leave and have very fond memories of our time in Genova. This place was amazing!! The staff was hands-down one of the best groups of people I've met. They were super knowledgable, and even took a few of us to some hidden gems around the city (which was awesome). Thanks for making my experience one that I won't forget! Overall this hostel was really nice and cute. They send an email about things to do in Genoa etc. and connect it to google maps which is very helpful. The breakfast was super simple, but the kitchen was big and had almost every appliance. I’d totally stay here if I go back, and definitely recommend it (it’s I think on the 2nd floor with stairs only). Definitely not the *cleanest* hostel but the amazing staff and incredible atmosphere make up where that lacks. It’s also in a fantastic location! 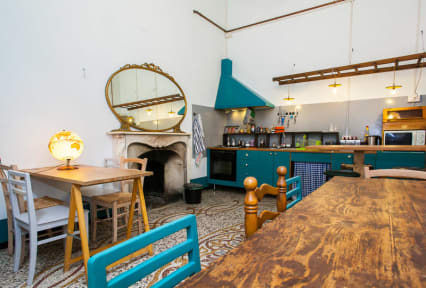 The hostel is fairly small and it’s a really open layout with a small lounge area by reception and a nice open kitchen which makes it super easy to meet people. Highly recommend staying here if you’re a solo traveler! It almost felt like a little family by the time I left.